Since ancient times, agaves have been used for multiple purposes. They provided honey water that allowed long migrations through the desert, honey vinegar and alcoholic beverages were obtained from it; it’s cooked hearts are a delicious meal, it is used as medicine, the spines as surgical and ritual instruments, its fibers for clothing, the leafs for roofing, the quiote for musical instruments, tools and as building material. Just like corn, agaves provided resources for different nomad tribes to settle communities and then develop complex civilized societies. Recent dicoveries in Tlaxcala, in the Cacaxtla ruins, showed that mezcal was first produced around the year 400 B.C., this makes Mezcal the most ancient distillation in the world considering that Al-Razi, invented the first known distillation method to the western world around 800 A.C. In those days, Mezcal was distilled in clay pots, just like it is still done today. Mezcal (from Nahuatl for “cooked agave”) was produced close to the ceremonial centers in small batches for elite rituals. All written evidence about it was burnt by Spanish occupation army and its production was banned to favor imported wine. Pulque, the fermented water honey from the agaves was the popular alcoholic beverage that appears in most codecs and oral traditions due to its popular consumption. Tequila is the modern iconic alcoholic beverage of Mexico, it is a distillation of blue agave from the Tequila region of the state of Jalisco that is consumed worldwide at a rate of 22 million bottles per year. For a small region from it is a huge business, but what that industry tries to hide is that it is just one type of mezcal. Tequila is a DO (denomination of origin) and it is to be produced from one type of agave, the Tequiliana Weber, or Blue Agave, and only in the Tequila region of Jalisco (at the beginning of the century it was called “Vino de mezcal de la region de Jalisco) Tequila has done well since the second half of the 20th century to depart as a lone ranger to become the most popular Mexican spirit. Today it is a multinational industry that has much more demand than what the blue agaves can produce in that region. The way to cope with that demand was to create flexible laws that could be easily bent. Tequila now can be produced with 51% of blue agaves and 49% of different carbohydrates. Agaves are cooked in metallic ovens with high pressure vapour, then fermented in huge stainless steel containers with chemical add-ons to fasten the process and to remove flavors from the different types of starches, and then most of the tequilas are aged in oak barrels which adds the flavor that it´s process lacks. All the chemicals added during the process are the ones providing the dreaded hangovers. On the other hand, mezcal is 100% agave and is produced in several States of Mexico, of which eight have a DO. These are Guerrero, Michoacan, San Luis Potosi, Durango, Tamaulipas, Guanajuato, Zacatecas and Oaxaca. The later is the most renowned for its unique diversity and quality, since Oaxaca is the most biological and ethnically diverse state in Mexico. Agaves are succulent plants that endure long droughts concentrating water an sugars in its “heart” They take several years to mature until they start their reproductive phase after which their life cycle ends. The agaves to produce mezcal are harvested when they reach their maturity. Some take 7 years, like the blue agave and espadin, and some wild agaves take up to 30 years to mature, like the agave marmorata, locally known as tepeztate, which makes a very refined and rare mezcal. The mezcal process is still mostly handmade, although there is already industrialized distillation from big companies that produce something that is almost mezcal, like Coca Cola´s Zignum and Oro de Oaxaca. 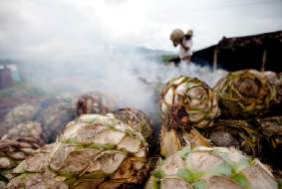 The traditional method of producing it still involves using earth ovens with firewood and volcanic stones to cook the maguey´s piñas, this method provides a unique smokiness and caramelized flavor that could range from chocolate to chiles to roasted nuts depending on different natural factors. The fermentation is done in ocote barrels, which is a native wood with resin that provides a good environment for natural yeasts to work on the sugars and produce alcohol. This fermentation is all natural, nothing except 5% of fresh water is added, and it takes from 7 to 15 days to ferment depending on the weather. During fermentation, essential oils are processed, providing the mezcal with tropical fruit notes and aromas, like pineapple, plantains and mangos. Mezcal can be produced with more than 30 types of mostly wild agaves from different ecosystems. In its purest form, it is handmade by families in small communities. The process is led by a maestro mezcalero who has the ancestral knowledge and is in charge of keeping the heritage alive. All the variables involved translate into a broad universe of tastes, experiences and cultures behind each Mezcal. No other region in the world has such a diversity to make wild 100% organic, craft, natural and cultural spirits. Mezcal is finally being recognized worldwide as a high quality and unique beverage that truly represents the deepest heart of Mexico´s diversity culture and history. Tequileros are also looting agave fields in Oaxaca, buying agave for their tequilas, but also cutting unmature, even newborn, wild agaves at an impressive rate. The rural communities and maestros mezcaleros have denounced this in several forums and to local and federal authorities, with little result. Small organizations of craft mezcaleros have arisen, and that is the only strategy now to fight the big multinational companies that have being buying politicians to lobby for them, and authorities to dismiss the ecological and economic catastrophe that is going on in the Oaxaca Valley this year. Organizing small producers of high quality mezcal and trying to get them the market share they deserve is the only way to avoid the disappearance of good craft mezcal. Most of the laws that politicians are trying to pass are with the goal of making the mezcal production the way tequila is; a low quality industrialized spirit that belongs to the big companies that run the tequila industry. The fight is on, David is angry and hungry, Goliath has to fall. People who love and respect Mexico´s traditions and heritage, should only consume mezcals that come from the small local producers, while enjoying the finest spirit produced in Mexico. Mezcal is a medicinal, ritual and celebratory spirit, deeply rooted in the culture and everyday life. Agaves were taken to a metaphysical level in pre-hispanic cultures, as a sacred emanation of life. Mezcal is a handcrafted product that reflects Mexico´s history, traditions, heritage, cultural and biological diversity. Just like any good piece of handcrafted art, mezcal shows the true and deepest heart of Mexico. Support Mezcal, drink it, kiss it, enjoy it!